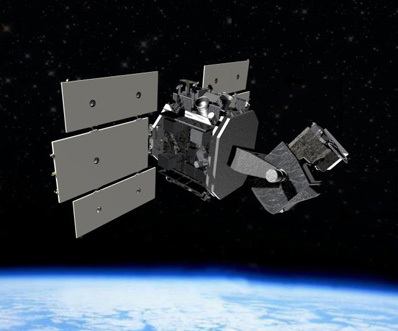 The U.S. military's new space surveillance observatory has begun maneuvering toward its operational perch to track orbital objects without the hindrances imposed on ground-based monitors. The Space Based Space Surveillance satellite successfully launched atop a Minotaur 4 rocket from Vandenberg Air Force Base in California on September 25, reaching its temporary orbit 336 miles high. "Since we launched, things have gone fantastic. We have kicked off a long series of firsts -- first acquisition, first commanding, turned on the buses, turned on the star trackers, moved the gimbals, turned on GPS. So things are ticking along and we're making great progress," said Lt. Col. Robert Erickson, SBSS Space Situational Awareness Squadron commander. "This morning, we did the first of three scheduled burns to raise our orbit. There will be three sets of those, so there's actually a total of 9 burns. We've done the first one, we'll do the next one in a little bit and another one later in the day," Erickson said in a telephone interview. The burns are designed to gradually increase the satellite's altitude to 391 miles, achieving the south-to-north, sun-synchronous mission orbit. The launch was the maiden ascent for the four-stage Minotaur 4, a satellite-carrying booster created by Orbital Sciences Corp. using decommissioned Peacekeeper missile motors and a commercial upper stage. The Air Force has 8 more launches ordered, including a flight from Alaska next month. Seeing the inaugural rocket blast off, however, came a year later than expected because of hardware and software issues. But despite the extended wait to work out the bugs, the new launcher debuted successfully and propelled the $858 million SBSS mission to space. "From all indications, it was a flawless, flawless flight. It put us exactly where we wanted to be," said Col. J.R. Jordan, SBSS mission director. "All of the work that various organizations...and the mission assurance that we had paid off and gave us a very smooth ride and a very safe ride. I think it is going to turn out to be a very reliable rocket to put small payloads into orbit." 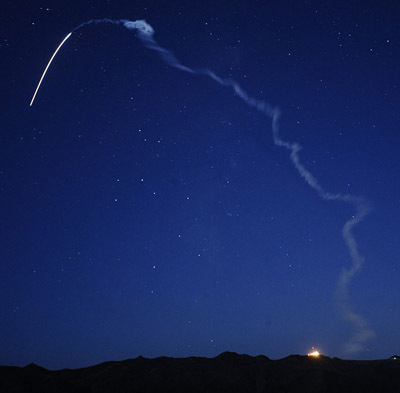 For Col. Jordan, having most recently served as vice commander of the Space Superiority Systems Wing in Los Angeles, the SBSS satellite launch caps a quarter century career in the Air Force. Today marks his final day on the job before retirement. "It's been a great honor to be in the Air Force for 26 years. It was great to be able to go out on such a great mission and have it be successful," he said in a phone interview this morning. Serving as the mission director during the countdown, Jordan oversaw the pre-flight preparations and gave the final approval to launch. "The mood inside the launch room was pretty nominal. Everything went pretty smooth," he recalls. "When I gave my last 'go' command at (T-minus) 6 minutes, 30 seconds, from that moment on it seemed like time went by really quick until the launch itself. Then time slowed down." The 15-minute trek to orbit crept by excruciatingly, knowing it was the make-or-break time after years of work. "We'd been so involved in the rocket and some of the issues we had with the rocket. Every stage was slower, it seemed like, until we knew we had final separation. It wasn't until we have final separation that I actually felt like we'd accomplished something," Jordan said. There's no margin for error once a booster leaves the launch pad. The rocket's programmed sequence of events had to occur perfectly, each stage must fire and drop away exactly as planned, and there's no way for engineers to intervene. Both Jordan and Erickson spent more than three years on the SBSS satellite. But understanding the true impact this mission will provide in tracking the dangers to U.S. satellites is still to come. "From a team perspective on the Air Force side, we see this as being a lot of capability that will add a lot of knowledge about what is up there in space. Obviously from a big picture perspective for the nation, we haven't collected any mission data yet with this satellite and time will tell. Frankly, I think as we use this satellite more, collect more data and we keep all this information and propagate the information, I think the nation will see that having (SBSS) up there is a tremendous asset," Jordan said. Putting a satellite into orbit to scan the sky will narrow gaps in ground-based surveillance using telescopes and radars that's limited by geographic locations, nighttime viewing and the weather. SBSS data should improve tracking of space debris and guard against enemy threats to military spacecraft. "I'm very confident that it's going to provide us flexibility with respect to tracking and detecting objects from foreign launches and the like, the ability to have a near real-time task-able system to chase those things is a tremendous advantage and it's not encumbered by terrestrial limitations of weather, day-and-night restrictions. It enables the (Joint Space Operations Center) to collect data when they need it, not when a ground asset may be able to see the target," Erickson said. The first two months of the SBSS mission is spent testing the system and ensuring it meets the expected requirements. That's followed by a characterization period to define the satellite's capabilities. It should be operational in about six months, Erickson said. For much more on the SBSS satellite and its objectives, see our launch story. Our live launch updates are archived in the Mission Status Center. And be sure to check out the Minotaur 4 rocket's launch photo gallery.